HIGH pressure stays in charge through the first half of this week but with more cloud building and a few scattered showers possible. We are on the cool side of the HIGH with an airflow from N/NE and occasionally brisk cool winds on the coast circulating round the HIGH. 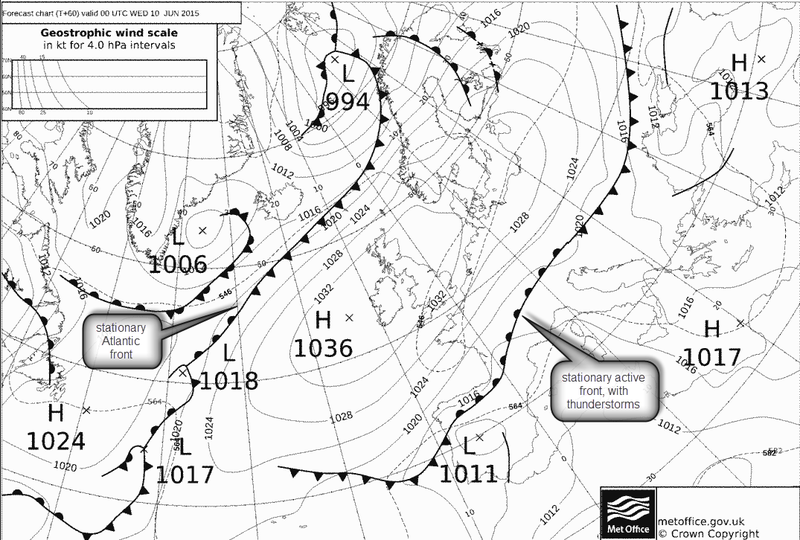 Easterlies / NE winds are due to build on occasions this week especially on the south coast as super-geostrophic wind circulating round the HIGH draws cool air from the North East. Cool nights are likely in a generally cool airmass when skies are clear of cloud and heat escapes. cool nights.. frost up north? 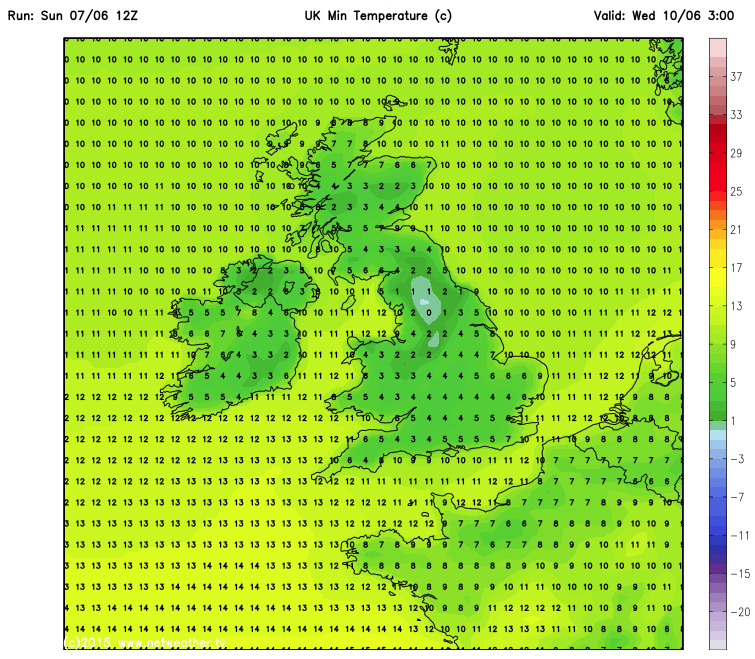 Could even be a touch of frost up north on first few nights early this week. The thickness chart above shows how the east side of the HIGH has a less “thick” airmass which is cooler as measured between 1000-500mb height). This means that, despite the overall high pressure, surface warming during the day can increase lapse rates lifting thermals into the cool air which can spark scattered showers as land warms through. There have been big thunderstorms in Europe along the front separating this cooler airmass from the building heat of the Med. 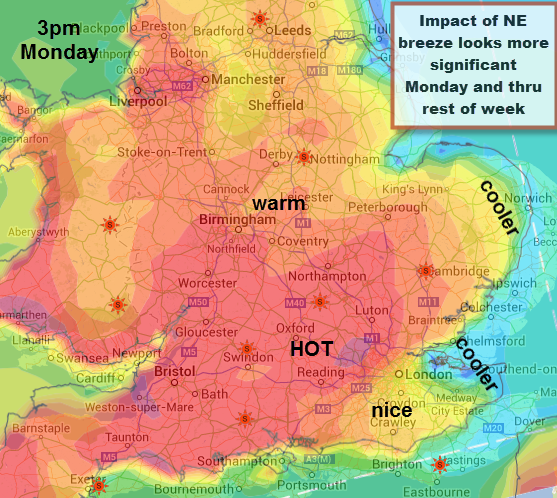 Whilst this is unlikely to be a full-on classic plume plume (update Tues… yes it could be best for some time!) it could sweep unstable air into the south and possibly cause thunderstorms. Heavy rain is possible too. 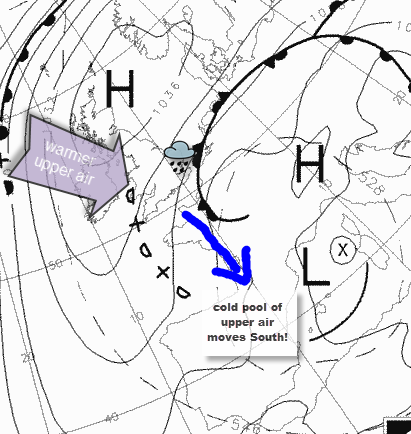 Thereafter the scene into the weekend looks more unsettled as a trough over the UK replaces the HIGH as it regresses (moves west) into the Atlantic. 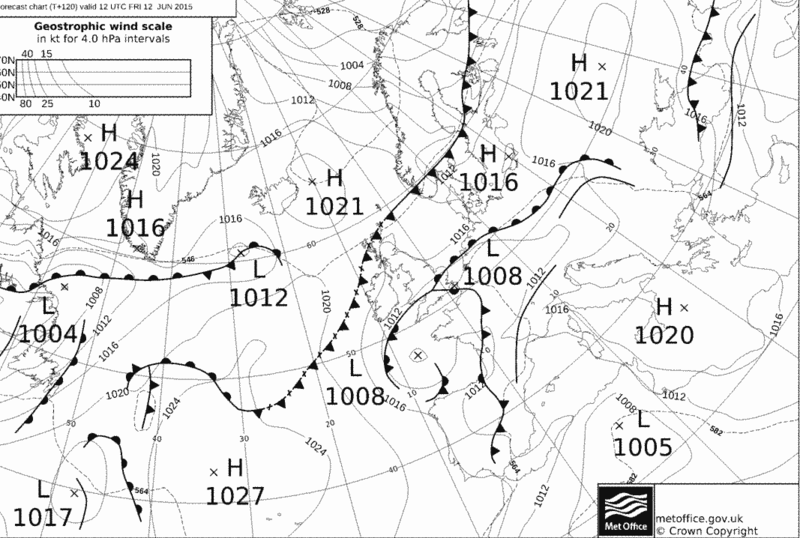 An Atlantic LOW from the NW looks on the cards for the weekend while pressure remains low. June has started cool (especially due to cool nights) and will continue to be overall cooler than average for the next 10 days. Note the change visible on the charts below. 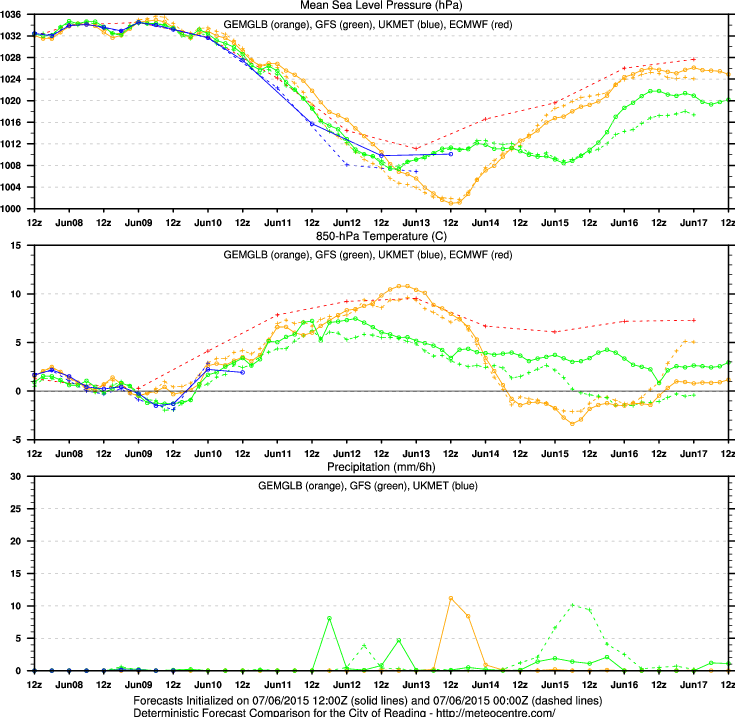 There is general agreement for this deterioration amongst models. So this week is likely to see a change to less agreeable conditions: lower pressure and a bit more rain at times and staying rather cool for summer! 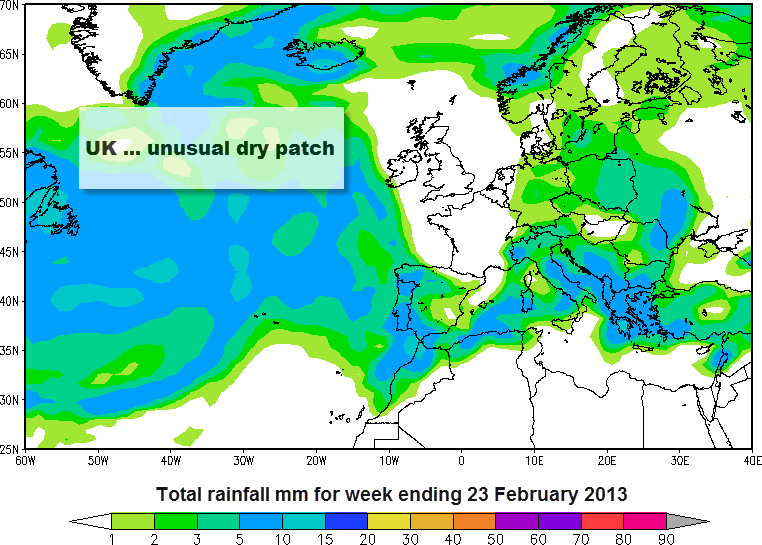 Reigate could be the driest place in N Europe this week if models behave! bringing showers to Europe and S UK? Despite the gloomy stratocumulus which didn’t shift much this weekend, it has been warmer than usual. Saturday night was especially balmy with Tmin of 16c and today saw Tmax a shade off 19c. This week warm Tropical upper air will continue to waft up from the South being generated by a deepening TROUGH of LOW pressure spinning up just NE of the Azores. 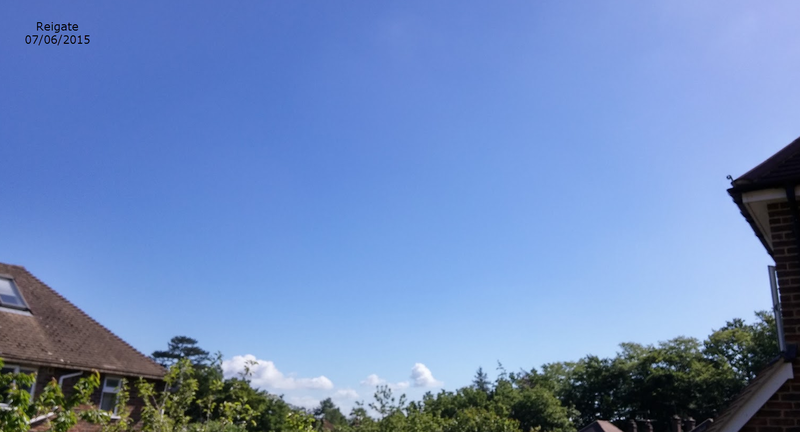 This will continue to pump a warmer than usual plume of upper air at +13c 850hPa (5000ft, the height air mass characteristics are usually measured) which flirts off and on with the south of the UK almost all week. The result is warmer than average September temps by some +4 ot 5c. It will, however, gradually get edge away as the week progresses. A weakening HIGH pressure over the UK will gradually melt away and drift over the continent and allow cooler air into Northern Britain. 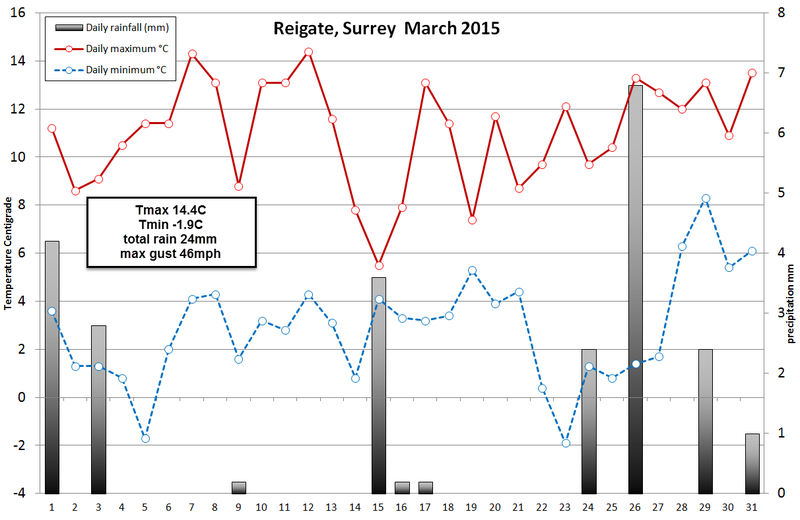 Reigate will remain in the warmer air most of the week by the looks of things. Most models agree that the Azores LOW will fill gradually and drift NE over Spain and France during the latter half of the week and bring a nasty rash of showers to those areas. 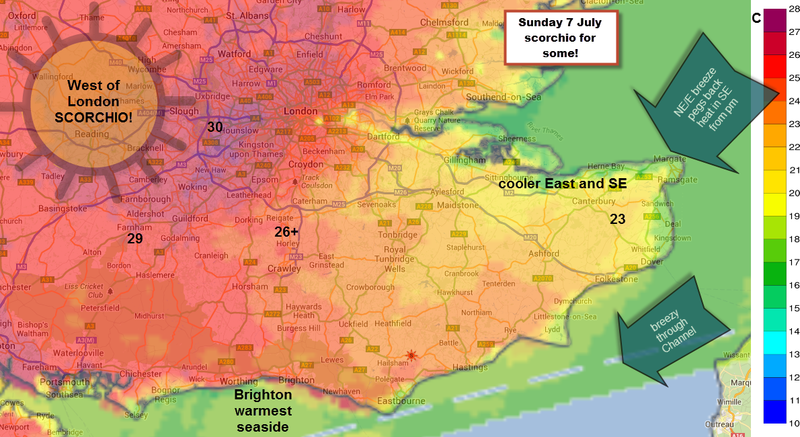 These might encroach on Southern England by the end of the week and weekend bringing potential for thundery outbreaks but this is too far off to be certain. 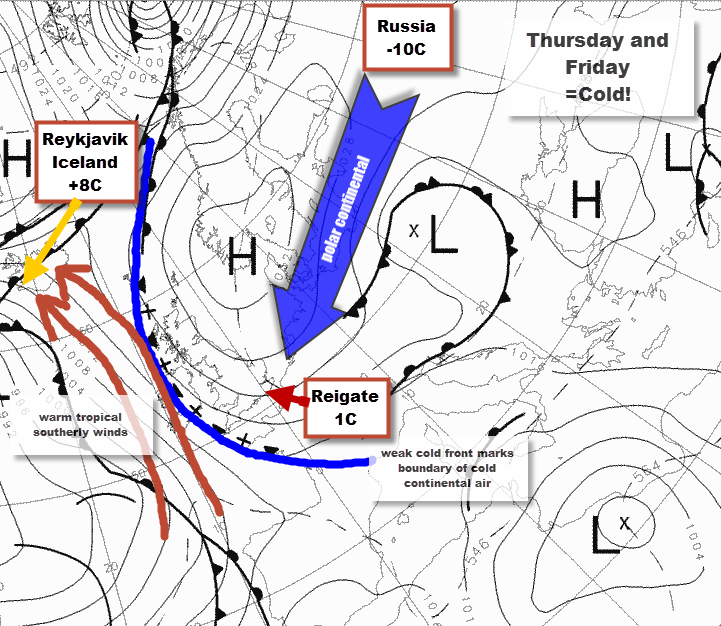 The distribution of rainfall is somewhat unusual, with a large accumulation of rainfall accumulating in a great spiral to the west of Spain associated with the Azores “Low” and lots of rain in Eastern Europe associated with the large Russian LOW. Note that the SE of England and Reigate in particular might just be one of the driest places in Europe by the end of next weekend as we seem to be sandwiched between these two great weather systems… well, models permitting! *one of driest places in Europe, probably! 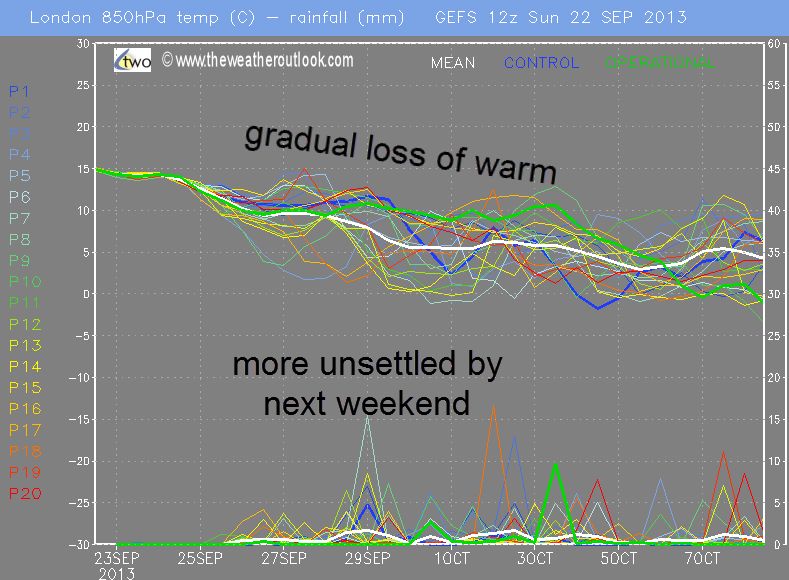 The GFS shows no rain at all for Reigate this week, but that’s quite a long shot! Another observation to match the LOW over the Azores is the negative forecast for the NAO: the North Atlantic Oscillation measure. The NAO shows the pressure difference between Iceland and the Azores: when NAO is positive there is a big difference / pressure gradient and a strong jetstream and unsettled, fast moving weather across the Atlantic. When negative, like this week, there is a meridional jetstream, a weak flow west to east and weather systems can get stuck… so not much change is expected. This matches the forecast this week… not much change and no fast moving weather. The ensemble model below shows that there will be a gradual decline in temperature during the course of next week and certainly beyond. More unsettled weather is also likely to arrive sometime next weekend but models still look rather uncertain so… keep checking back! Sunrise January 1st 2013: dawns bright and beautiful! Happy New year! 2013 dawned bright and beautiful over Reigate for January 1st 2013 as the low pressure of recent weeks gradually gives way to an anticyclone (High pressure) building from the south west which will bring calmer and drier weather for us in Reigate for a week or so, after a final shower or two tomorrow. It may not be that sunny though: anticyclonic gloom is common in winter. 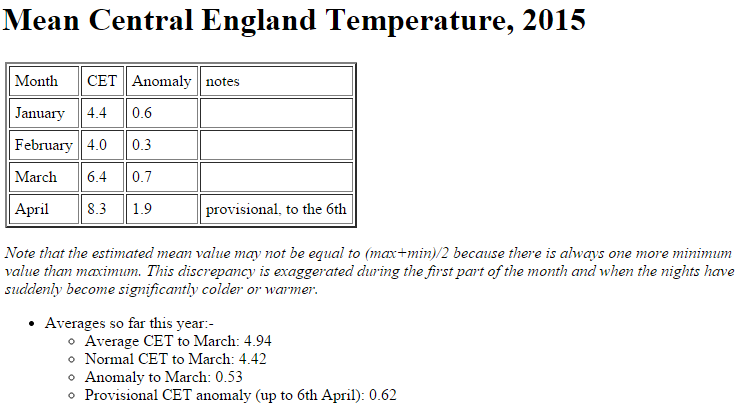 Also, check the chart below as temperatures are due to take a slide (predictably for January!) from the weekend.